Home » cooking , food , turkey frying » Hey, live near Reidsville, North Carolina? Want a professionally-fried turkey for Thanksgiving? Read on! Hey, live near Reidsville, North Carolina? Want a professionally-fried turkey for Thanksgiving? Read on! Lots of this blog's readers are well aware of my obsession with/addiction to deep-fried turkey. I first heard about it nine years ago this month and then spent two more years studying the technique and getting brave enough to attempt it. With that first succulent bite in 2002, I knew that Thanksgiving would never be the same for me again. I'll never go back to basted turkey if I can help it. For me, a bird as magnificent as a turkey deserves better. Deep-frying it is the only way to honor what no less an authority than Benjamin Franklin once decreed should be our national fowl. This is not mere "cooking" to me. This is an art! One that demands meticulous care and attention and passion. That this is also considered the second most dangerous form of preparing food known to man (after cleaning fugu) is even more extra incentive to treat turkey frying like delicate surgery. I love my work but I also know how to be really careful. I haven't been burned yet and Lord willing, I won't be anytime soon either. Well anyway, for some reason my fried turkey has always been a smashing success for Thanksgiving and Christmas and a few other festive occasions. It's always the first thing to go at the family table. And a bunch of folks have told me over the years that I should go public with my nigh-patentable technique. That I could offer my services to others, for a reasonable fee. I hadn't really given it much thought. But y'all know me: I'll try anything once! 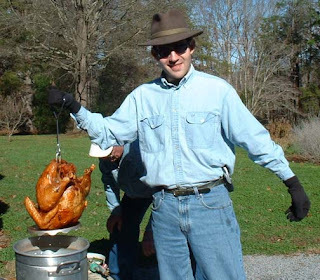 If you live anywhere within driving distance of Reidsville and your mouth is already watering for one of those gloriously seasoned and deep-fried turkeys like you see me holding in that photo, fire me an e-mail at theknightshift@gmail.com and I'll get back in contact with you. Thanksgiving is a little less than two weeks away. I've already got a few orders in and can fit in some more. People have cooked food for years too. Julia Child still made a million dollars doing it. Nobody does turkey like Chris. A restaurant couldn't do it like he does. You're welcome at our house if you're willing to travel to Minnesota to fry that turkey!